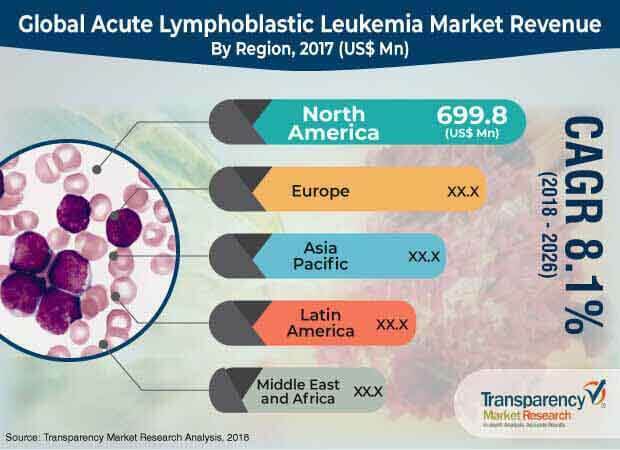 Transparency Market Research (TMR) has published a new report titled, “Acute Lymphoblastic Leukemia Market - Global Industry Analysis, Size, Share, Growth, Trends, and Forecast, 2018–2026”. According to the report, the global acute lymphoblastic leukemia market was valued at US$ 1,627.5 Mn in 2017. It is projected to expand at a CAGR of 8.1% from 2018 to 2026. Expansion of the pharmaceutical industry, government initiatives, increase in health care expenditure, surge in research & development, and rise in patient population are anticipated to augment the global market from 2018 to 2026. Acute lymphoblastic leukemia, one of four major types of leukemia, is a blood cancer that starts in the bone marrow and spreads into the blood, rapidly. Acute lymphoblastic leukemia is an aggressive type of leukemia, which requires early treatment; without treatment, most patients with acute leukemia would live only a few months. Acute lymphoblastic leukemia is more common among children aged above five. Increase in patient population for acute lymphoblastic leukemia propels the market. According to recent study, around 412,000 people worldwide are likely to be diagnosed with some type of leukemia, and acute lymphoblastic leukemia accounts for approximately 12% of all leukemia cases worldwide. According to the American Society of Clinical Oncology (ASCO), nearly 5,970 cases of acute lymphoblastic leukemia (ALL) were reported in the U.S. in 2017. Demand for therapeutics for acute lymphoblastic leukemia has increased in the last few years. This has resulted in the rise in new product approval and number of clinical trials in late and early phases of drug development. For instance, in August 2018, Novartis AG received approval from the European Commission for its CAR-T cell therapy (Kymriah) for B-cell acute lymphoblastic leukemia. For instance, in 2017, Baylor College of Medicine started conducting phase 1 clinical trials of CD5.CAR/28zeta CAR T cells, Cytoxan for T-cell acute lymphoblastic leukemia. The study is expected to be complete by June 1, 2036. Rise in scientific and technological advancements in R&D and manufacturing processes is projected to increase the efficiency of drug development. However, high cost associated with the treatment of acute lymphoblastic leukemia is anticipated to restrain the market during the forecast period. Development of therapeutics require the utilization of expensive instrumentation, which in turn increases the overall cost of therapeutics and treatment for the disease. For instance, the cost of chemotherapeutic Arranon (Nelarabine) is between US$ 75,000 and US$ 100,000 in the U.S. In terms of revenue, the acute lymphoblastic leukemia market in Asia Pacific is projected to expand at a high CAGR during the forecast period. Rapidly increasing patient population in the region is expected to boost the demand for therapeutics for the treatment of acute lymphoblastic leukemia. This, in turn, is likely to drive the market from 2018 to 2026. Increase in government expenditure on health care is anticipated to fuel the acute lymphoblastic leukemia market in Asia Pacific during the forecast period. For instance, according to India’s Union Budget 2017–2018, the total health care expenditure was increased from 1.97% to 2.27% of the total union budget. The report also provides profiles of leading players operating in the global acute lymphoblastic leukemia market. These include Sanofi, Pfizer, Novartis AG, F. Hoffmann-La Roche Ltd., Sanofi, Erytech Pharma, Inc., Celgene Corporation, Amgen, Inc. Bristol-Myers Squibb Company, and Spectrum Pharmaceuticals, Inc. Increase in mergers & acquisitions, strategic collaborations, surge in clinical trials, and new product launches are expected to drive the global market during the forecast period. For instance, in January 2017, Novartis AG signed collaborative agreements with various key industry players to co-develop and co-commercialize oncology therapies.